To begin with please review your motivation for studying this topic because without an appropriate attitude and motivation, activities are less useful and meaningful, and might be neither Dharma1 nor spiritual practice. Three scopes of attitude are considered appropriate. If the motivation for an action such as coming, going or meditating is to avoid one's own rebirth after death in the unfortunate realms of existence, this is Dharma or spiritual practice of the most modest or least scope. The motivation is of middle scope if the aim is to avoid rebirth anywhere in cyclic existence thereby achieving one's own liberation. Finally, the highest motivation, of a person of great scope is if one practises to achieve enlightenment for the sake of all beings. Studying the teachings with excellent attitude and motivation is very powerful, less good is of middling benefit and the least or weakest is not so significant. The supreme attitude or motivation, embracing all living beings, is thinking "Everything I do until I achieve enlightenment is for the sake of all sentient beings. All I do from now until my death I dedicate to every single living being without exception. Particularly I dedicate everything I do this year, this month, this week and today for the sake of all living beings." This highest motivation "To be of benefit to all living beings I shall use my time and energy to achieve enlightenment" is important for students and teacher alike. It is dreadful if a teacher's whole reason and mental attitude for teaching is to make money, become famous, be well thought of, make friends and so forth. Likewise, if students have these attitudes, their motivation for study and practice is completely wrong. The Kadampa lamas, great Tibetan practitioners of the past, had a saying that two particularly important focal points of any activity are at the beginning and the end. At the beginning it is especially important to have a good kuenlong – an appropriate attitude or motivation. At the end, having performed a well-motivated activity, it is important to make prayers of dedication. By making such prayers, all the virtuous goodness created by engaging in the action with such a positive motivation is retained. For example, if subsequently one gets angry without having dedicated the good energy created by an action, the anger completely destroys the benefit. However, having dedicated, even if one gets angry later, it cannot destroy the goodness. Therefore, it is very important to dedicate. There are traditional prayers like the jam.pel pa.wo that begins, “Just as the great bodhisattvas of the past like Manjushri and Samantabhadra, made dedication, I also dedicate.” With this one mentally transfers one's positive energy to the safe-keeping of these two bodhisattvas, entrusting them with the virtue created. Even without knowing the formal words of the prayer, it is sufficient to understand the main point which is thinking that "I dedicate exactly the same as whatever prayers of dedication all the buddhas and bodhisattvas, those great holy beings made in the past and are making now." Similarly, when setting the motivation, think, "With my life, time and energy, may I too engage in every action they did and are doing for the sake of all sentient beings! May I emulate them!" To examine the Heart Sutra word by word from the beginning would take too long and might become tedious for those who have already studied teachings on emptiness. With some experience of emptiness study there is already some understanding, so it could feel frustrating to start from the beginning without reaching the main point. In general there are several methods to study and meditate on emptiness. The following are the best known lines of reasoning leading to an understanding of emptiness. The line of reasoning of being free from one and many analyses the very nature of things. The vajra slivers line of reasoning analyses causes. The line of reasoning analysing the results of things is the refutation of existing and not existing. The reasoning of dependent arising is known as the king of reasoning. The title of this sutra is The Essence of Wisdom, often known as the Heart Sutra. Just as our heart is the most important part of our body, this sutra contains the heart or essence of the Prajnaparamita Sutras, the most important teachings of the Buddha. Prajnaparamita means the Perfection of Wisdom, the Wisdom Gone Beyond or the Transcendental Wisdom. Amongst the Prajnaparamita Sutras are the extensive, middling and concise Mother Sutras. The great or extensive one is the Perfection of Wisdom in 100,000 Verses; the middling is that in 20,000 verses and the concise one is in 8,000 verses. The Essence of Wisdom sutra is so-called because it contains the essence of all of the wisdom sutras. Different types of wisdom analyse conventional and ultimate phenomena. The ultimate here means emptiness. The wisdom intended when calling The Essence of Wisdom a sutra containing the essence of all the Prajnaparamita Sutras is wisdom analysing the ultimate which means wisdom realising emptiness. Various levels of this are wisdom from hearing or studying, wisdom from reflecting or contemplating, and wisdom from meditation. Wisdom analysing the ultimate analyses and realises emptiness. This wisdom is the complete opposite of the ignorance which is the true-grasping or self-grasping mind, the root cause holding us in cyclic existence. Although this wisdom and ignorance have completely opposite ways of engaging they refer to the same object. Being directly contradictory, they are complete opposites. The Prajnaparamita Sutras explicitly teach or reveal the stages of profound emptiness. Implicitly they explain the grounds and paths, the various realisations produced or arising sequentially in the mind of the practitioner gradually progressing through the path, and the methods of practice. Lama Tsongkhapa wrote The Brief Explanation of the Way of Discerning the Difference between the Sutras of Definitive and Interpretative Meaning more commonly known as the Dependent Arising Praise in which he explained emptiness by stating that the Buddha based all he taught on everything which exists being a dependent arising. Buddha taught emptiness never losing the perspective of it totally fitting with everything being a dependent arising. Tsongkhapa made the point that, in the multiplicity of teachings Buddha gave, everything was taught in terms of dependent arising. In other words, Buddha never taught so that you could possibly lose sight of the view of everything being a dependent arising. Furthermore, by teaching like that, absolutely everything the Buddha taught was aimed at helping all sentient beings to overcome all inner mental afflictions and every fault and problem deriving from those afflictions. In other words, absolutely everything the Buddha taught was aimed at bringing all sentient beings to the state of nirvana. What the Sanskrit term nirvana means is "the state beyond sorrow." This means beyond the sorrow of the mental afflictions. By what method can beings achieve this peaceful state which goes beyond or completely transcends all inner mental afflictions? One can achieve the state beyond sorrow with the wisdom realising emptiness. 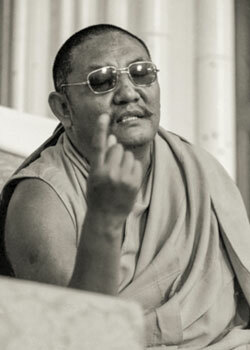 At present, sentient beings are unable to see the true nature of their own minds. The wisdom realising emptiness will enable them to see this. The presence of mental afflictions prevents us from seeing the true nature of our minds. By meditating on that nature we can overcome those afflictions, (Tib. nyon mongs; Skt. kleshas) and thus achieve the state beyond sorrow. It is said that by extinguishing karma (action) and the kleshas (mental afflictions) we find liberation. Mental afflictions impel us to engage in harmful destructive actions that lead to our experiencing suffering in the future. Karma (action) refers to destructive actions engaged in through the force of mental afflictions. Suffering arises due to karma, and karma arises due to mental afflictions. Because of mental afflictions we engage in harmful karmic actions. Where do they come from? Tsongkhapa's text makes the point that karma and afflictions come from a particular kind of conceptualisation, the true-grasping mind (ignorance). Destructive actions (karma) come from mental afflictions derived from this true-grasping conceptualisation (Tib. nam.tok) or "superstition" - in other words, the mind of ignorance or true-grasping. The way to eradicate this true-grasping mind is by reflecting upon and understanding dependent arising. "Dependent arising" refers to the fact that everything arises (comes into being or existence) through depending on other factors. The prologue to the Heart Sutra is called "a basis for the discussion" (Tib. ling.shi), meaning the background or setting for the sutra. For example, in the case of some of the monastic precepts there is an explanation about how a particular precept came to be given. This can include a description of how a certain monk made a mistake and how, when the Buddha came to know of this he said, “This is something that the monks and nuns should not do.” From that point on the monks and nuns had to follow that precept. The background to how and why it came about is called the ling.shi or prologue. Thus I have heard at one time: the Lord was sitting on Vultures Peak near the city of Rajgir. He was accompanied by a large community of monks as well as a large community of Bodhisattvas. On that occasion the Lord was absorbed in a concentration called the profound appearance. The common prologue describes how the Buddha was sitting with a great community of monks and bodhisattvas. The special prologue, that he was absorbed in a concentration called the profound appearance means that the Buddha was himself reflecting or meditating on emptiness. Meanwhile the bodhisattva, the great being, the noble Avalokiteshvara was contemplating the profound discipline of the perfection of wisdom. He came to see that the five aggregates were empty of any inherent nature of their own. The Buddha meditates on emptiness and throughout most of the rest of the sutra starting from "Through the power of the Buddha", he blesses and causes a change to occur in the mental continuum of two of his disciples, Avalokiteshvara (Tib. Chenrezig) and Shariputra. He blesses their continuums so that Shariputra asks Avalokiteshvara a question. The rest of the text is Avalokiteshvara's answer. This is the Buddha's holy word spoken from his own mouth. Although more detail is possible, this gives a rough idea of the structure. To recap, a question comes from Shariputra followed by Avalokiteshvara's answer, and both are the word of the Buddha called the "blessed word". Later where the Buddha says, “Well said, well said,” he confirms that what Avalokiteshvara said about emptiness is absolutely faultless. That is also the Buddha's word, specifically that spoken by the Buddha. Thus there are three sections. In brief, the Heart Sutra, has three points - the question from Shariputra, the answer from Avalokiteshvara and finally the Buddha's approval. Teachings on the Heart Sutra, a Perfection of Wisdom text by Geshe Jampa Tegchok in Somerset, England 2007. Geshe Thubten Soepa gives a teaching on why we should be vegetarian and protect the lives of animals. This teaching by Geshe Thubten Soepa is transcribed by Carol Beairsto. Click here to find out more about FPMT's Animal Liberation Sanctuary. Visit Enlightenment for the Dear Animals for more resources and information about helping animals. First, I would like to tell you a little about myself. My name is Geshe Thubten Soepa. I completed my Geshe Lharampa exam, and then taught philosophy in Asian monasteries. Afterwards, I went to Germany and around Europe for nine years at FPMT centers. I am still a travelling FPMT Dharma teacher. I would like to say that Lama Zopa Rinpoche has taken responsibility to protect animals with his animal sanctuary project. 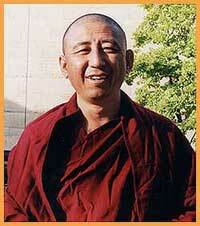 His work is a fantastic example of a Tibetan Buddhist lineage lama. I rejoice and may these merits result in him having a long life and good health. You, as the director of Lama Zopa´s animal sanctuary and all those who are involved, working for the wishes of Lama Zopa Rinpoche, as you know, you too are collecting good karma. I rejoice! I say this with scriptural proof. In this regard, there are actions extending life. What are they? To give up killing, to praise giving up killing, to encourage others to give up killing, to save the lives of those sure to be killed or supposed to be killed such as humans, cattle, goats, sheep, fish, pigs, birds, game, and so on.... To protect from fear beings oppressed by it, to generate compassion towards those who do not have a protector, to generate loving kindness towards the sick, towards children, and towards the elderly, to give them food, medicine, and so on, to generate compassion towards beggars, as well as preventing war, and the like. Being kind to animals, saving them, and protecting them is not a matter of religion... It is something everyone should do. Except for a few cultures and religions, and some people who naturally don’t eat meat, most of the world has the bad habit of eating meat without analyzing. If we analyze the details, humans don´t need to eat meat. Their natural body system is not like tigers, snakes or lions. Humans don´t have fangs. Many years later, some gods and goddesses ate earth and dirty foods. Their light disappeared and they could not fly. They could not see their companion gods and goddesses. Then they started to have sexual relations. Generations later they ate meat and blood. They started to become violent and kill each other. That was the beginning of being human. Human translates into Tibetan terminology as “mi” or “minang”. “Mi” means "I cannot see my companion gods and goddesses." Therefore, countless years ago, our lineage grandfather and grandmother gods, did not eat meat. Generations later eating meat became a bad habit. This explanation comes from Abhidharmakosha cosmology. Abhidharmakosha comes from the seven arhat`s Abhidharma great Buddhist texts. It doesn´t come from Buddha Shakyamuni sutras. Buddhist philosophies agree that our lineage originated from grandfather Brahma and many gods and goddesses. Buddhist philosophy never believed in a creator god. Also, Jain, Sankhya and Carvaka philosophies don´t believe in a creator god. But some religions believe that grandfather Brahma is creator god, such as different Hindu religions and philosophies. Nowadays, we have bad habits everywhere. Millions and millions of people buy and eat meat. This creates the killing, suffering and torture of millions of animals everyday! Indirectly this creates animal hell. Therefore all virtuous buyers, sellers and consumers create the same negative karma or sin. This explanation comes from Shakyamuni Buddha’s Lankavatara Sutra and Kalachakra tantra. Hey, Mahamati, if no one eats meat in any way whatsoever, then no living beings will be killed for its sake. Mahamati, innocent living bengs are killed for the sake of their value; killing for other reasons is rather rare. All tremble at violence; all fear death. One should not kill, nor cause to kill. All tremble at violence; life is dear to all. Are bhiksus, sramanas, and brahmanas. Everyone shuns them to stay alive. Don’t cause any harm to others! It says that whoever gives up harming others, having understood this in accordance with the situation set forth, is a virtuous practitioner. Furthermore, in our ordinary thinking, we believe that when we eat meat, it will make us strong and healthy. But in reality, it indirectly causes the decline of our physical health, mental health, brings many sicknesses such as heart and liver disease, high blood pressure, high cholesterol, breast cancer, diseases of the womb and digestive system. You become forgetful, less intelligent, overly aggressive and violent. And it destroys our realizations, compassion, perfect wisdom or correct understanding and peaceful mind. Also, you wrote about millions of turkeys, chickens and animals being killed every day for food and profit. This problem comes from nowadays our situation money has big power. Money looks like creator god. Of course, people are over-focused on making money. Even money controls leaders of countries. They think that if they have a lot of money and can do anything. When people believe in this idea, then they care less about an ethical life and good morality. They over-focus on money which results in killing, stealing, cheating, lying, destroying the natural environment, the killing of animals and the selling of meat. This reality is a foolish idea because it results in our poor health and brings many sicknesses. It destroys our welfare. This is my opinion. Please immediately don´t believe this. We will continually need to analyze, and come to a real understanding ourselves. Hey, Mahamati, moreover, in this regard those who kill, kill and trade because they want profit. Whatever fools eat meat, buy the meat for money. Those who perform the killing want profit, so they kill animals that fly in the sky, live in the water, or walk on the earth, in many different ways--with iron hooks, slings, and nets--thus seeking profit. Mahamati, as there is no so--called meat that has not been ordered, that is without seeking and without perception, you should not eat meat. And so, we need to develop great compassion with correct wisdom. This is everyone´s important responsibility. I will continue to read Buddhist sutras and analyze logically. Perhaps one day I will write another book about it.